Introduced at the Mobile World Congress (MWC 2011), the HTC Flyer is one of the most interesting gadgets available in the tablet world. 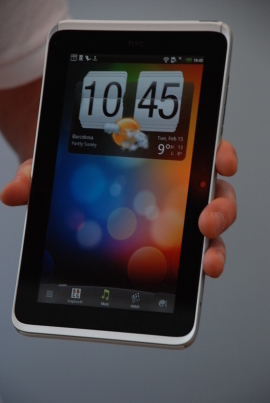 The sleek aluminum body with a 7-inch display is what mostly attracted the gadget craving users. Showcased at the grand event, tech analysts were left wondering about its arrival in the United States. The CTIA 2011 brought in the answer to those impatient gadget lovers. Sprint re-branded the HTC Flyer as the WiMax-equipped Evo View while Best Buy announced on opening sales for the Wi-Fi only version of the tablet, later this spring. Most of you might already be wondering on the features of the device with Best Buy confirming on the tablet retailing with almost all the features witnessed at the debut. At the time of launch, the Flyer would come powered with Google’s Gingerbread Operating System later to be rooted on Honeycomb. Over the past few months we’ve seen several new tablets enter the market, and we’re especially excited to partner with HTC to bring the Wi-Fi version of the HTC Flyer to our customers as a national retail launch exclusive. We have worked hard to bring a large assortment of great tablets to Best Buy and Best Buy Mobile stores, and the HTC Flyer is a great example of that effort. Best Buy’s Flyer is rumored to carry a price tag of $669 and to be available this Spring.